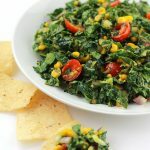 Place washed and chopped kale in a large bowl. Slice, peel and dice avocado and squeeze the juice of half a lemon over avocado. Transfer avocado to bowl with kale, with clean hands, massage and squeeze avocado into kale until well combined. Add in tomatoes, onions and corn relish, mix well. Transfer to serving dish and serve with chips of your choice.